Have you ever been through a museum and caught a glimpse into a back room? One that looked tantalizingly full of interesting records and objects not yet out on display? Well, the folks at Zooniverse are offering you the chance to have a closer look at some of these things. Notes from Nature is a brand new project that has digitized thousands of specimen images, labels and ledgers from museum collections and biologists. These collections document where species and populations exist now and where they existed before, so they are key to uncovering the patterns of changes over time. Scientists use such data to address key environmental issues, such as the impacts of climate change. Right now, there are two collections available to transcribe. The SERNEC collection is made of herbarium specimens: flowers and plants pressed onto sheets along with descriptive labels. 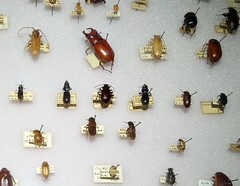 The Calbug collection is made of pinned insect specimens drawn from eight California institutions. There will soon be an ornithological (birds) collection from the Natural History Museum. To participate, you simply need to sign up or login with your Zooinverse login at the site, pick a collection, and start transcribing what you see on the screen. In this project, you can also earn badges for your transcription efforts, as a record of your contribution. While the sight of a bee may freak some people out, it gladdens a farmer’s heart. That’s because bees are vital to agriculture, where they play a key role in pollinating our crops. Unfortunately, North American bee populations have been under a lot of pressure lately. In addition to the so-called colony collapse disorder, which is still befuddling bee keepers, a type of fly known as the zombie fly (Apocephalus borealis) has taken to parasitizing honey bees in California and South Dakota, turning them into … you guessed it, zombees. 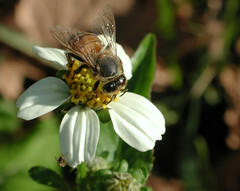 Female zombie flies will lay their eggs in live honey bees. The egg hatches into a larva (maggot), and the maggots begin feeding on the bee. After a number of days, an infected honey bee will abandon its hive during the night and fly toward a source of light, where it will die. Once the maggots finish eating the bee, they exit the bee and form pupae. In two to four weeks, the pupae hatch into adult flies, and it all starts again. ZomBee Watch is a citizen science project sponsored by the San Francisco State University Department of Biology, the San Francisco State University Center for Computing for Life Sciences, and the Natural History Museum of LA County. The goal is to find out how much of a threat these flies are, by determining where honey bees are being parasitized. To participate, you’ll need to create a light trap near a bee hive, (carefully) collect any bees that collect near the light, and do a pupae count if zombie flies emerge, and send photos of your data to the Zombee Watch website. There’s a complete tutorial here. In this project, it’s important to note that reporting dead bees that don’t have any pupae emerging is just as important as reporting when they do emerge. This is because it gives researchers a more accurate picture of how far the new zombie fly habit has spread, and it may also give further clues as to the cause of colony collapse disorder. Ready to get started? Here’s where you can register.